What items will be on sale at the market? Each market aims to provide shoppers with a wide range of quality preloved goods as well as unique and/or handmade goods and services. The market consists of stallholders that are mums and dads (and grandparents) who are selling their preloved or handcrafted goods. Although we will most likely have your required item for sale, we cannot guarantee it, as we don’t know exactly what stallholders will bring on the day. We suggest you come early to have the opportunity to view the widest selection. 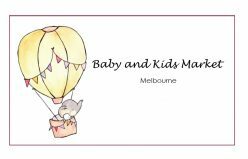 How can I be kept up to date with the upcoming Baby and Kids Market Melbourne? Check out the Market dates on our website. Follow us on Facebook and join the events you are interested in and you will receive notifications closer to the market date. We charge a nominal fee of $3 per adult to enter the market, kids are welcome for free. This will put you automatically in the draw for some fabulous door prizes!! The entry fee assists with the running costs of the event. Without an entry fee the market would not be able to operate. Is there food avalaible at the venue? The venue will have yummy food and drinks for sale. We are not responsible for these. Are there only pre-loved goods? We have mostly pre-loved stalls, but there are also business and handmade stalls at the Baby and Kids Market Melbourne. They might have some great market specials available on the day! Can I purchase goods with a credit/debit card? All Baby and Kids Markets are cash only so make sure you bring enough, however, some of the business stalls may have a credit card facility at their stall. Is there an ATM at the market? Yes. Fortunately most Market venues have an ATM at the venue. We will advise you if there is not one nearby. What if it rains, will the market be cancelled? All Baby and Kids Market Melbourne are held indoors so the event will always go ahead regardless of the weather. There are many things you should consider before you sell and/or buy pre loved baby and kids goods. We have prepared a list of product safety guideline websites that we recommend you consult prior to buying or selling pre loved goods at Baby and Kids Market Melbourne. Lovely! Please visit the Selling section of the website to view the Stallholder Information and follow the prompts to book a stall.